Established in the 8th district of Lyon since 1972, IARC (The International Agency for Research on Cancer) will move to the heart of Lyon-Gerland Biodistrict in 2020, to the former EFS (French Blood Agency) site. The new premises will accommodate 500 international employees and researchers compared with the current Lyon site which only has room for 230 researchers of 50 nationalities. The project is a strategic move for the territory. It will strengthen the reputation of Lyon-Gerland Biodistrict, which plays host to many life sciences actors, industries and institutions (Sanofi-Pasteur, Merial, CLARA, P4 laboratory etc.). This constantly evolving district will also gain European and global visibility. 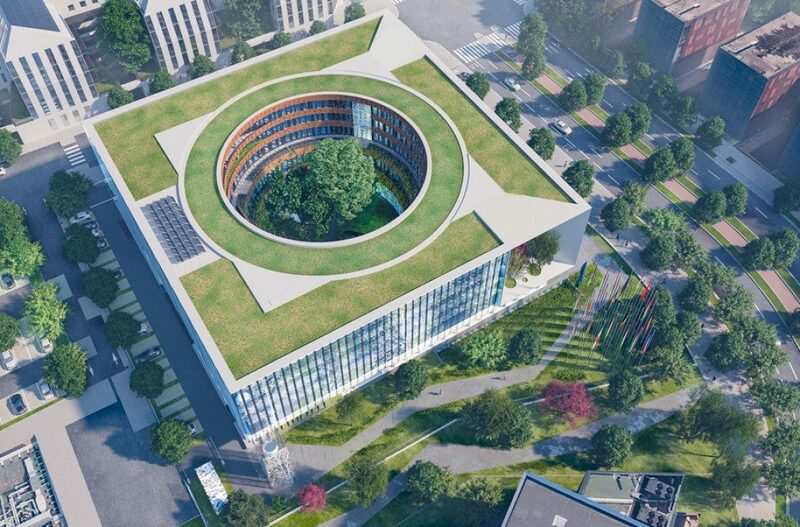 This new headquarters will provide IARC with a building of 11,315 sq. m, including 7,150 sq. m of scientific working space (laboratories, etc. ), 1,600 sq. m for administrative services, logistics and technology, and 2,500 sq. m, including rooms for conferences and an auditorium, transforming this building into a venue for French excellence. Inspired by its circular shape, the project will also include a 1000 sq. m planted garden. The technical and architectural design is inspired by biomimicry. Indeed, a double-layered glass “skin” with thermochromic blades will prevent too much noise, heat and light from penetrating the walls. Plant-inspired motifs will also appear on the façade to reduce the effects of sunlight. Le project is estimated at 51.6 million euros, and is financed by Métropole de Lyon, the State, the Auvergne Rhône-Alpes region and IARC itself. IARC, established in 1965 by the World Health Organization (WHO) and attached to the United Nations (UN), is an intergovernmental body promoting cancer research. The institution studies the causes of the disease and its prevention. It participates in the education and training of researchers around the world, especially those from developing countries, through scholarships, courses and by publishing papers. IARC is the only international institution to have its headquarters in France, apart from UNESCO located in Paris. It is also the only independent international research organisation in the world.